To celebrate the Year of the Anacostia, HerChesapeake took a guided boat tour of the river led by the Anacostia Watershed Society (AWS), to learn the history and progress of restoration efforts that have helped bring back the health and wildlife of this waterway. In August, members of HerChesapeake met up with Maddie Koenig from AWS at Bladensburg Waterfront Park for a two hour boat ride on the Anacostia River. AWS has been working to restore the Anacostia watershed for almost 30 years, hosting clean ups and restoring wetlands to improve the health of the river and surrounding communities. Hosting boat tours is one of the ways the organization educates and engages the public with their work. While the river has a long way to go, Maddie explained to us how far the river has come in recent years. One of great moments while being out on the water was the sighting of wildlife, including bald eagles, blue herons, and ospreys. Even just a few years ago, these birds were nowhere to be found near the river. The Anacostia, over several decades, had become the dumping ground for sewage and pollutants, as well as sediment from agriculture and urbanization. What used to be a river depth of 40 feet in its historic state has shrunk to three feet in that same location, due to years of sediment runoff from development. The original span of wetlands, historically more than 2,000 acres, is now down to the hundreds. Trash, including tires and garbage, lined the river banks and clogged tributaries. But 2018 has been a key year in the improvement of the Anacostia. 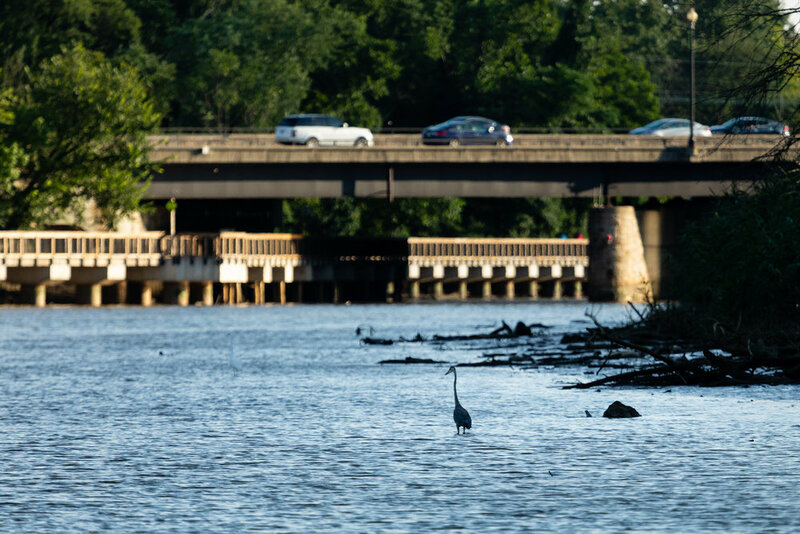 Thanks to years of river cleanups, tree plantings, invasive species removal, and wetland plantings by groups such as AWS, as well as some major projects that finished up this year, the Anacostia has shown enough progress to receive its first passing grade in its 2018 report card. Maddie also explained that the recent completion of the Anacostia Tunnel Project has played a huge role in the reduction of sewage and bacteria to the river. Together, these efforts have improved the water of the river, as well as the surrounding habitat for wildlife. As the tour continued, our boat sailed by bikers on the nature trail, kayakers paddling ahead, as well as deer and a beaver on the river banks. It was a welcome sight to see the enjoyment of nature in a place once called America’s most polluted river. A lot has happened in the Anacostia watershed over the years. For a full history, and what a restored Anacostia might mean for the future, check out Anacostia Rising by Jacob Fenston and Tyrone Turner — WAMU 88.5.